W&W’s Share the love week with Pinkfresh Studio! Did you know that Winnie & Walter is celebrating Share the Love week this week with Pink Fresh Studio? Today is day #3. To view and read about Day #1 and #2, check out Winnie & Walter’s Blog. Kinnari from Pinkfresh Studio generously provided us designers with gorgeous products from the Felicity collection. Thank you so much for your generosity, Kinnari! I love the collection. Fact is I love all your collection. They are so trendy and fab. I loved how the Felicity collection coordinates with many of Winnie & Walter’s products. I got carried away and made four cards. So make yourself a cup of coffee and enjoy! First up is a happy card. I showcased the beautiful pattern paper and die cut from Felicity collection on this card. I incorporated In a Word: Happy die from Winnie & Walter in this card. Best of all I love the puffy sequins. So cute. //embedr.flickr.com/assets/client-code.js Next, a similar concept card using different pattern paper and puffy stickers from Felicity collection paired with Winnie & Walter’s Cutaway – The Big, the Bold and Seasons! I absolutely love love this pattern paper. 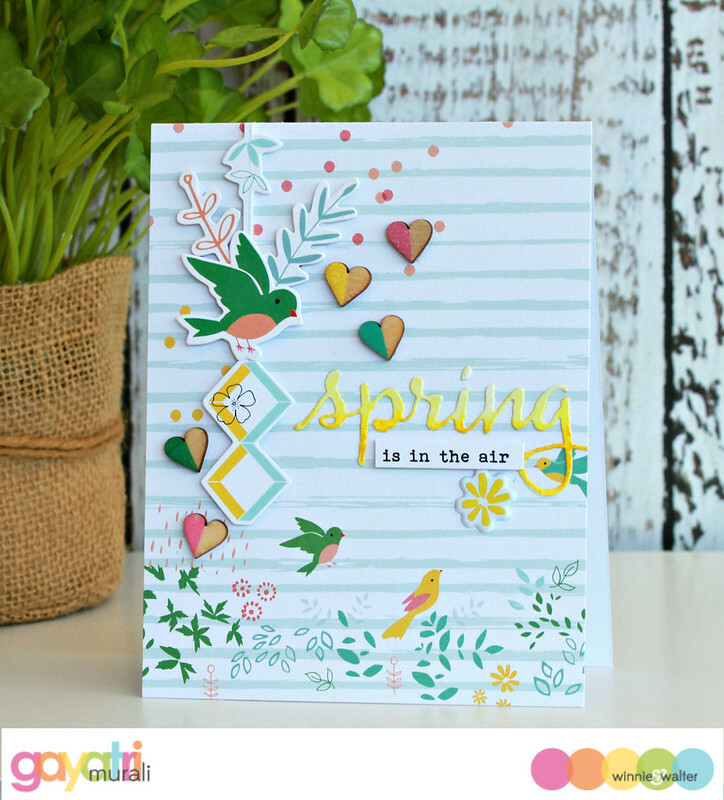 It has spring written all over it with a very trendy and cool look to it. So fab! I used the die cuts and the wood veneer hearts from the Felicity collection on the card. 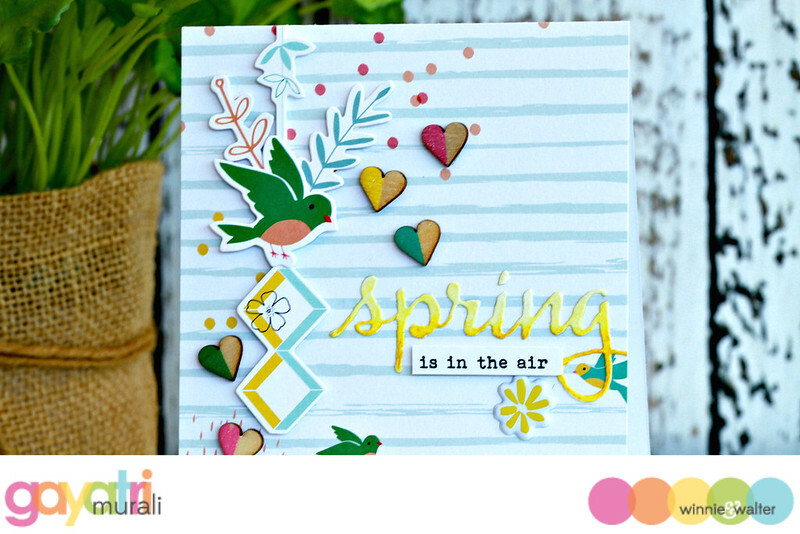 The sentiment is a mix of die cut from Winnie & Walter and Felicity Collection. 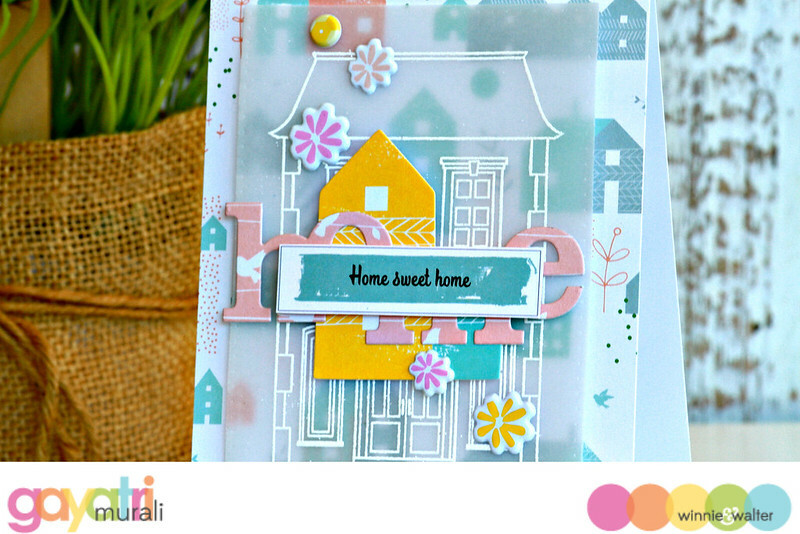 The third card is a layered card using the house elements from the Felicity Collection paired with the house from This Awesome House stamp set and In a Word: Home Cutaway from Winnie & Walter. And finally, another layered card using similar concept. For this card, I stamped the flowers and leaves from the stamp set from Felicity Collection to make my second layer pattern paper. I die cut the pattern paper and stamped paper layer using the rectangle dies from Essentials: Katharine Cutaway. The vellum tag is die cut using the tag from the same Cutaway set. 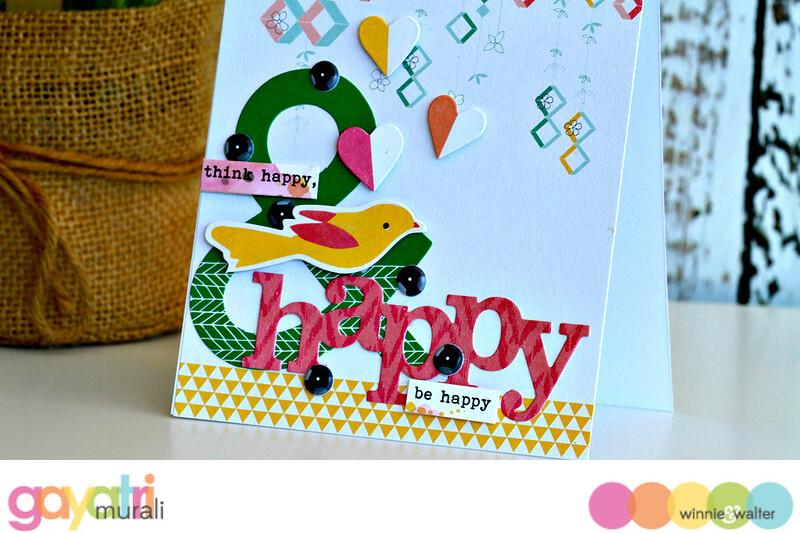 I then layered the vellum with die cuts from Felicity die cut pack, followed by In a Word: happy die cut with sentiment die cut on top. I also added a few puffy sequins and puffy elements to bring the card together. I thoroughly enjoyed playing with both Pinkfresh Studio’s Felicity Collection and loved how the collection coordinated with Winnie & Walter’s products so well. And all of these cards are totally out of my zone. Best part is I am so thrilled how they turned out. Hope you like them too. There are lots of goodies and gift certificates to be won. Here is how to enter. 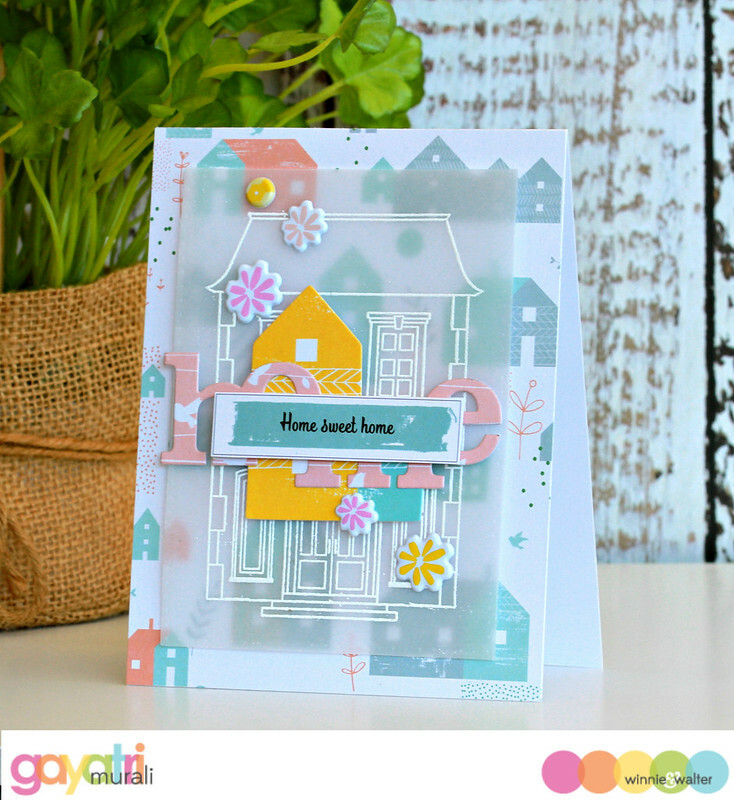 Create a new project inspired in some way by today’s projects by Gayatri. This project can be combined with other challenges from w&w or elsewhere. Please post your project on your blog, on an online gallery, social media and link it up using the Link-up tool on this post. When you post your project please make sure to include which project inspired you and how. One randomly chosen project linked to this post’s Link-up tool will win a $25 gift card (coupon code) to the w&w shop. Two randomly chosen projects from all of the Share the Love Week featuring Pinkfresh Studio’s Felicity collection will win the selection of Felicity collection generously provided. A *HUGE* thank you to Kinnari of Pinkfresh Studio for her big, generous heart! Oh wow, fabulous products and beautiful work!